Women in India typically use old sarees and cloths and layer them with Kantha stitch to make a blanket, throw or bedspreads.The vintage material is stitched together with colorful thread to create these beautiful, softly layered cotton throws.Our vibrant quilts are reversible. When you need a fresh look, just flip them over. Each throw is one-of-its-own-kind. Vintage Chindi Rug comes in several shapes, sizes, patterns and colors. 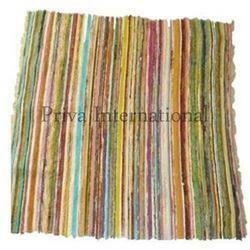 Vintage Chindi Rugs are made up with the finest quality & weave. Easy to clean and wash these rugs are designed with perfection and woven with attention to details so that the best can easily be delivered to the clients. cotton block print rugs comes in several shapes, sizes, patterns and colors.cotton block print rugs are made up with the finest quality & weave. Easy to clean and wash these rugs are designed with perfection and woven with attention to details so that the best can easily be delivered to the clients.